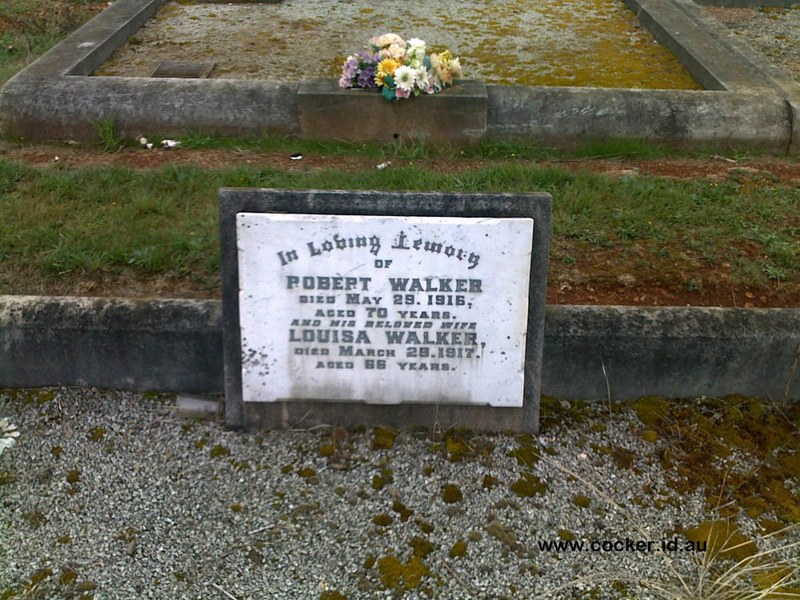 2-Robert Wilson Walker, the fifth child of Michael and Sarah Walker, was born on 4 Mar 1844 in Annandale, Perth, Tasmania, died on 29 May 1916 in Devon Hospital, Latrobe at age 72, and was buried in May 1916 in Deloraine Cemetery (D101-524). 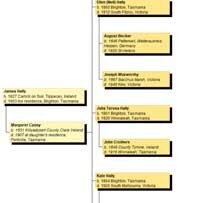 Robert married Frances Louisa Gillam, daughter of James Michael Gillam and Mary Holmes, on 5 May 1868 in Westbury, Tasmania. Frances was born on 1 Mar 1851 in Westbury, Tasmania, was christened on 19 Mar 1851 in St Andrew Church, Westbury, died on 29 Mar 1917 in Exton, Tasmania at age 66, and was buried in Mar 1917 in Deloraine Cemetery (D101-524). The family moved to Green Hills, Hagley in 1847 and in 1856 they moved to Exton to the farm known as Tea Tree Farm. 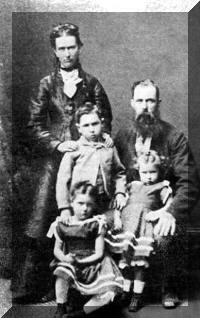 Robert met and married Frances Louisa Gillam, daughter of James and Mary (formerly Holmes) Gillam. The ceremony was performed by the Rev. Joseph Waterhouse at the home of Robert's parents. 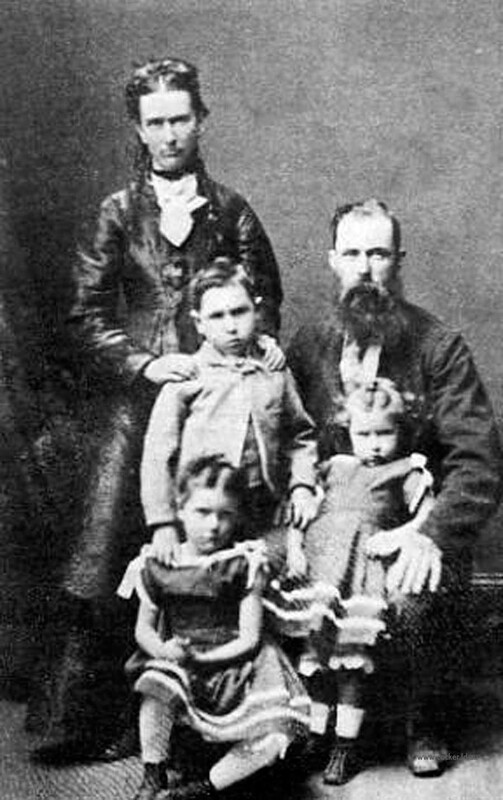 Louisa's father James came out to Tasmania from England at the age of 12 with parents Thomas and Frances Gillam in 1829. James was a shoemaker by trade. Robert carried out farming at Osmaston on the farm now owned by Graham Larcombe. All of his 13 children were born there. In 1899 owing to an injury to his leg the family moved to Moltema, then known as Whitefoord Hills where they had a general store. Robert and Louisa retired to Station Lane at Exton where they were living when Robert died. Robert died at the Devon Hospital in 1916. Louisa died at Exton in 1917. 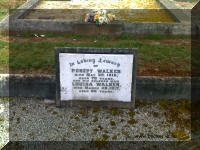 They are both buried in the Deloraine cemetery. There passed away at the Devon Hospital an old and highly respected resident of Exton, after a long and painful illness — Robert Wilson Walker, son of the late Michael Walker of Exton, who had spent over 60 years in the district. The sympathy of the community goes out to the widow and grown-up family of 13 children — seven sons and six daughters, and 50 grandchildren. Of the daughters Mesdames E. A. Soden, F. Hay, E. Andrews and A. Viney are residents in and around the Devonport area, Mrs. Scott is at Westbury and the sixth is on the mainland of Australia. The eldest son resides in New Zealand. Herbert, Leonard, George, Hedley, Robert and Edwin are all in the State of Tasmania. Deceased was 71 years of age. The funeral left his late residence on Thursday for Deloraine and was largely attended.